I recently broke my seven-year streak of only using smartphones in the tradition of Nokia’s fabled N900. The reason for this change was the growing age of my Jolla phone combined with my continued desire for a working physical keyboard1. In today’s market overflowing with faceless, exchangeable, uninspired and uniform touch-only devices this left me no choice but to opt for the last true BlackBerry: The Passport. The BlackBerry Passport is the last device that was both manufactured by RIM and runs their QNX based OS 10 operating system. OS 10 offers everything you can expect from a state of the art smartphone operating system. Furthermore its communication stack is beyond comparison and renders any third-party mail, calendar, task and contact applications redundant - as one would expect of a device built by the erstwhile mobile handset pioneer. The system integrates perfectly with the hardware and features true multitasking that is exposed to the user in a Maemo-like fashion. One very nice feature is the keyboard’s touch capability that allows for text-navigation and scroll movements without touching and thus obscuring the actual screen. Although the native app catalog obviously doesn’t feature as many applications as are available on the big platforms I don’t miss anything2. QNX is a unixoid real-time operating system that is very interesting in its own right. A nice side benefit of this is the ability to run a native terminal emulator and execute cross-compiled UNIX tools in the way I got used to during my time with Maemo and Sailfish OS. Sadly BlackBerry OS 10 is deprecated and won’t receive future support as the whole platform has been discontinued3. Luckily I found the system to be very stable and feature complete. Thus I don’t see any immediate problems requiring continued support - as long as I can compile and install my own code. 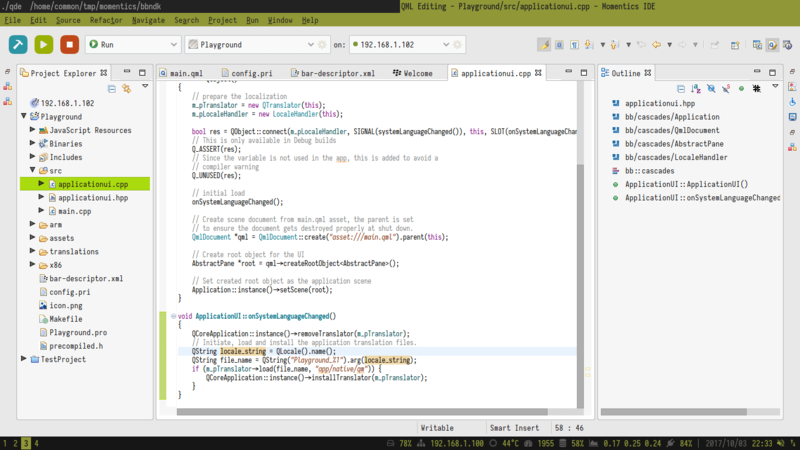 OS 10 application development is based mostly on C++ and Qt/QML which suits my preferences quite nicely. Additionally the default stack includes a Python 3.2 interpreter as well as the ability to install and run arbitrary APKs. ~/tmp/xul/xulrunner contains the extracted contents of a matching XUL runtime version 10.0 archive. While enabling the development mode in the device’s settings menu is just a toggle flick away and only requires a device password to be defined actually installing a program archive generated by Momentics requires one to register with RIM in order to be able to sign the archive. Fortunately enough this process is completely free and devoid of any further organisatory hurdles. ./blackberry-connect $device_ip -password $device_password -sshPublicKey ~/. After some investigation I was able to trace this issue to some custom system update trickery I performed during the first days of setting up the device4. Luckily this was easily solved by resetting the device to the latest OS 10 version via the official autoloader. As the alert reader might have noticed everything described in the last section hinges on the continued willingness of BlackBerry to generate and distribute development certificates without which one cannot deploy applications to physical devices. This is probably one of the primary tradeoffs one makes when leaving the world of open mobile systems behind. Luckily there is a way to cross compile, install and run arbitrary CLI programs without even enabling the development mode: mordak/playbook-dev-tools. This set of scripts developed by the same person that wrote the premier native terminal emulator for OS 10 offers a fully automated systems that compiles and installs GCC 4.6.3 amongst further development and system utilities. It remains to be investigated if this entry point can be expanded to device-local development of full Cascades-based UI applications.